When Julien’s Auctions contacted me about selling my kidney stone to GoldenPalace.com for an original price of $15,000 I turned it down knowing that my tunics from Star Trek have commanded more than $100,000. I offered the stone, stint and string for $25,000 and informed Darren Julien that 100% of the proceeds would go to benefit Habitat for Humanity and I retain visitation rights. 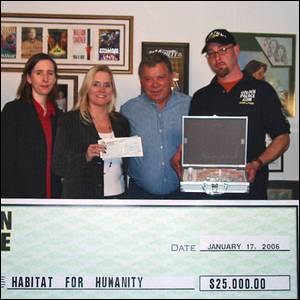 GoldenPalace.com agreed, cut a check for $25,000 for Habitat for Humanity, which made a nice addition to the $20,000 donation the cast of Boston Legal had raised the year before, and the charity ended up with a sizable donation on behalf of Mr. Shatner’s misbehaving kidneys. Image courtesy of Julien’s Auctions.